The bones in our hands are covered with smooth cartilage and connected with ligaments. Ligaments are firm tissues that provide support and enable us to position our hands for finger movements. The ligaments are lined with a Synovial Membrane. The Synovial Membrane secretes a thick liquid called Synovial Fluid. The Synovial Fluid acts as a cushion and lubricant between the joints, allowing us to perform smooth and painless motions. Ganglion Cysts arise from the fluid filled areas on the ligaments or between the bones. The cyst is a round sac-like structure filled with Synovial Fluid. The fluid is harmless and not cancerous. The fluid can become thick over time, making the cyst feel firm and spongy. It is common for cysts to grow larger, but they will not spread to other parts of your body. Ganglion Cysts occur most frequently on the back of the hand and wrist. These cysts, called “Dorsal Wrist Ganglions,” are the most common type of cyst. Ganglion Cysts occasionally develop on the palm side of the wrist near the thumb and on the fingertips, just below the cuticle. Ganglion Cysts can appear on the lower extremities as well. They may form on the outside of the knee or ankle and on the top of the foot. The second, most likely theory is that the Ganglion Cysts form because of structural flaws in the joint tissues. The cyst may develop when Synovial Fluid collects between the joints. As the fluid builds up, it may create a bulge where the tissues are weakened. Some cysts are painless, but the majority cause some degree of discomfort. The pain is usually continuous and may become worse with activity. You may experience a tingling sensation, considerable pain, or numbness if the cyst is pressing on a nerve. You should have your physician evaluate a suspected Ganglion Cyst, but it is not a medical emergency. Your doctor can diagnose a Ganglion Cyst by performing an examination and talking to you about your symptoms. Your doctor will feel your cysts and ask you about their degree of tenderness. Your surgeon will numb the area before removing the cyst. Following the surgery, you will wear a splint on your wrist for a few days. Your doctor may recommend therapy to mobilize and strengthen the joints. Some Ganglion Cysts require no treatment and disappear on their own. Your doctor may recommend that you wear a wrist splint. This can help relieve pain caused by activity. Physicians may also use Needle Aspiration to treat Ganglion Cysts. 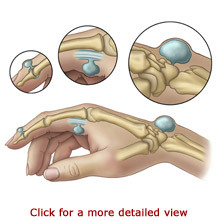 Your doctor will numb your wrist area for the procedure and remove the fluid from the cyst using a needle and syringe. The site will then be injected with an anti-inflammatory steroid medication. Needle Aspiration is a fairly successful treatment, although some individuals may need to have it repeated a few times. Your wrist will be splinted following the procedure to promote healing.